Decided to go back to an estate sale I had visited on Saturday for the 50% off on Sunday. Had a hunch that I would find enough good stuff left to make it worth my while. And I did!! Though honestly, from a profit standpoint, some of my finds are barely worth the time and effort to sell. But sometimes I just enjoy rescuing things and finding them new homes. Plus I like having a variety of price points in my store. 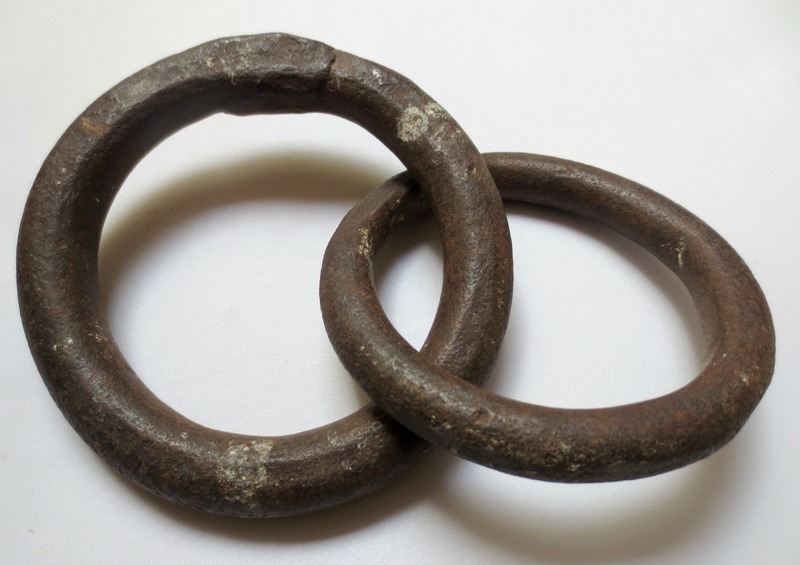 I spied these rusty, possibly hand-forged iron rings in the dust under a desk! Not sure what they were used for. I keep thinking maybe they were from a farm. I do believe they are quite old. 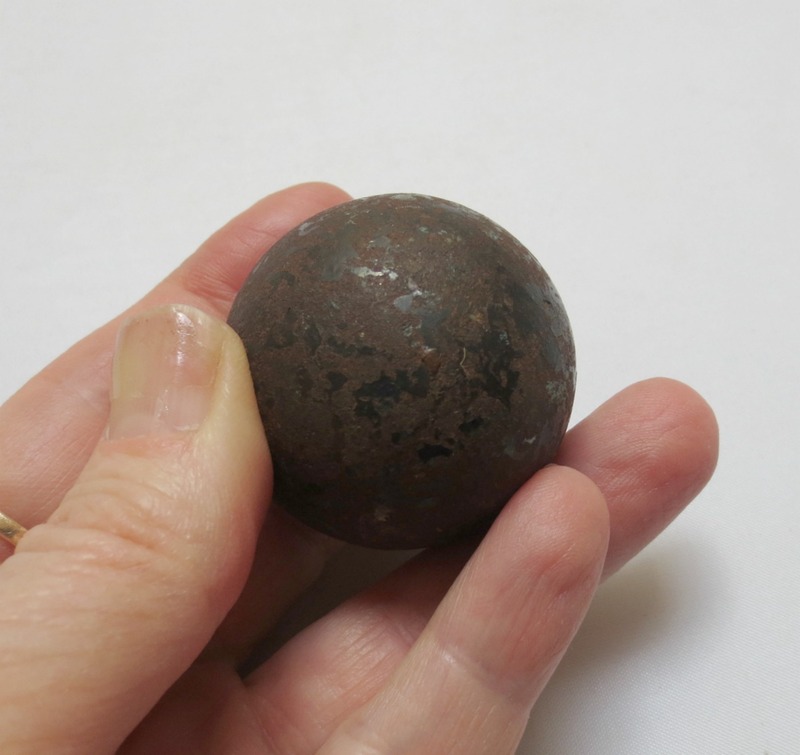 Then I found a little cast iron ball on a table. Hmmm. Perhaps these would make a fun grouping. Will these appeal to anyone else? Beats me! 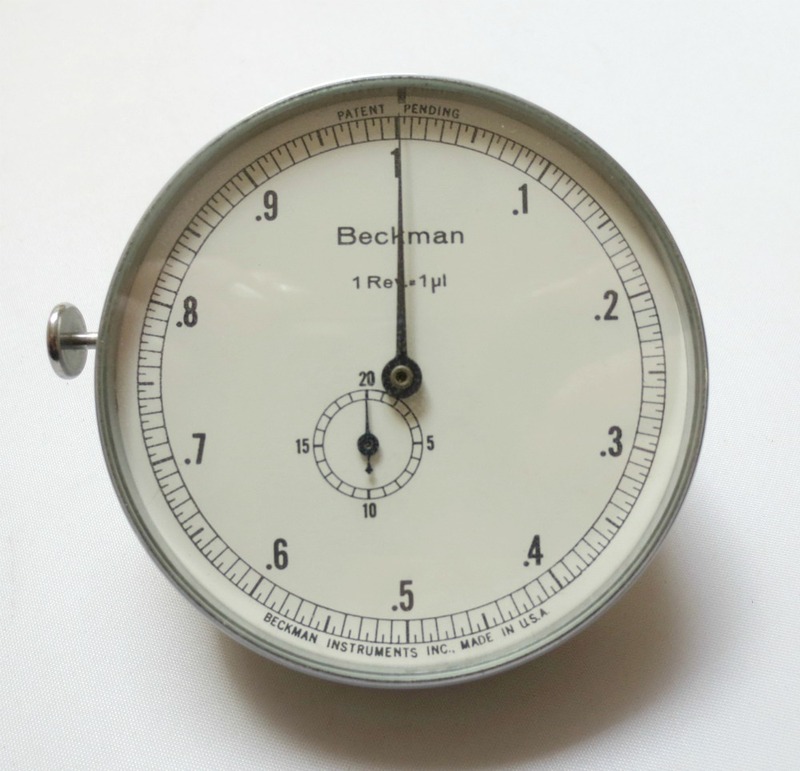 I saw this Beckman Instruments gauge on Saturday and it was still there on Sunday so I decided to go for it. Perfect steampunk gadget. It pre-dates the 1998 Beckman acquisition of Coulter (creating the Beckman-Coulter Co.), so I’m thinking 1970s/80s, and it appears to have never been used. 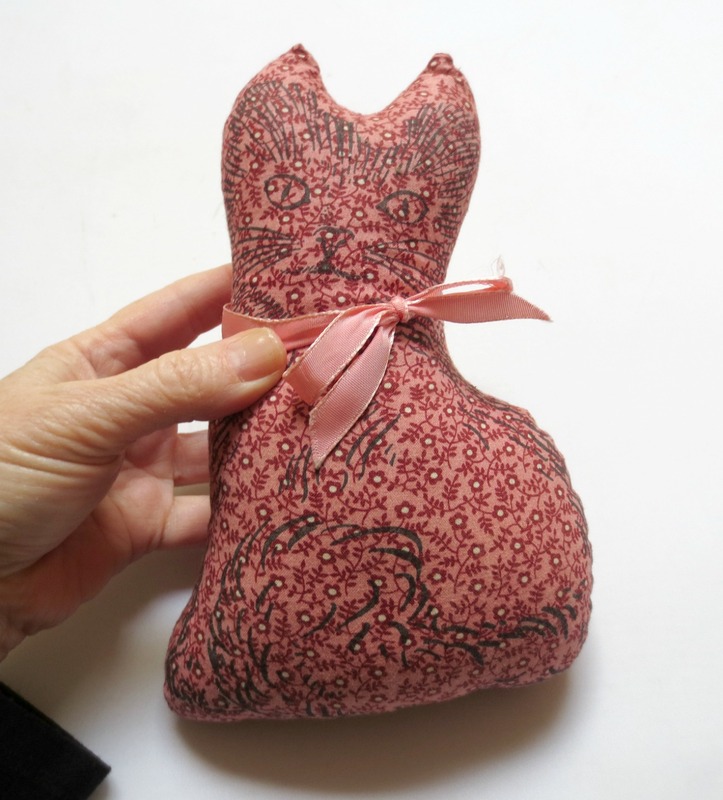 I had to say “yes” to this 1960s/1970s fabric cat doorstop/toy/pincushion. She’s in great condition and super cute. 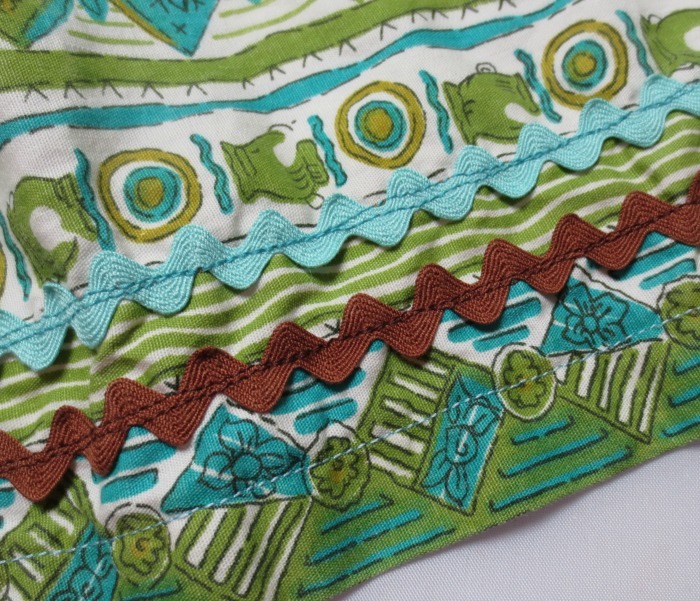 Decided I might as well get this 1970s handmade cotton apron with rick-rack detail. Does anyone else remember rick rack? I’m sure I had clothes edged with it. 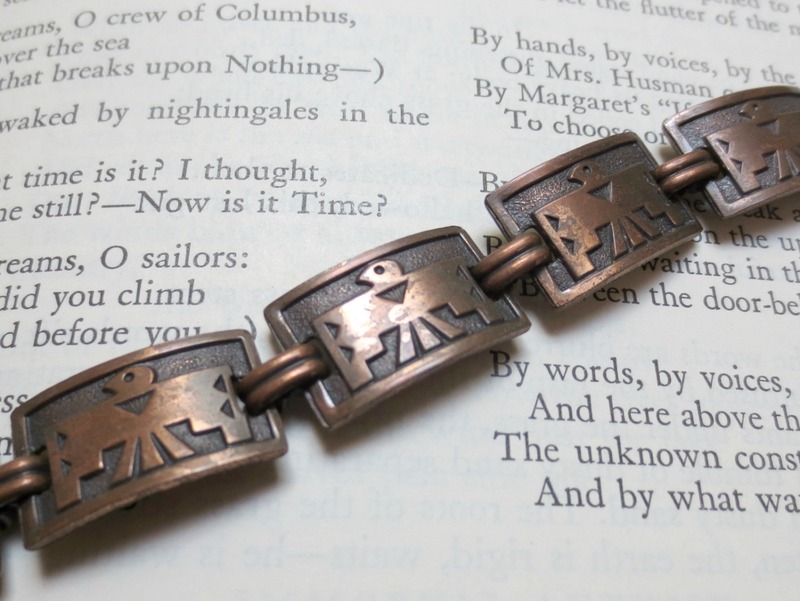 A few pieces of jewelry were left and I thought this copper thunderbird unisex bracelet was kinda cool. Originally from Bell Trading Post, Colorado, though it’s missing its hang tag. 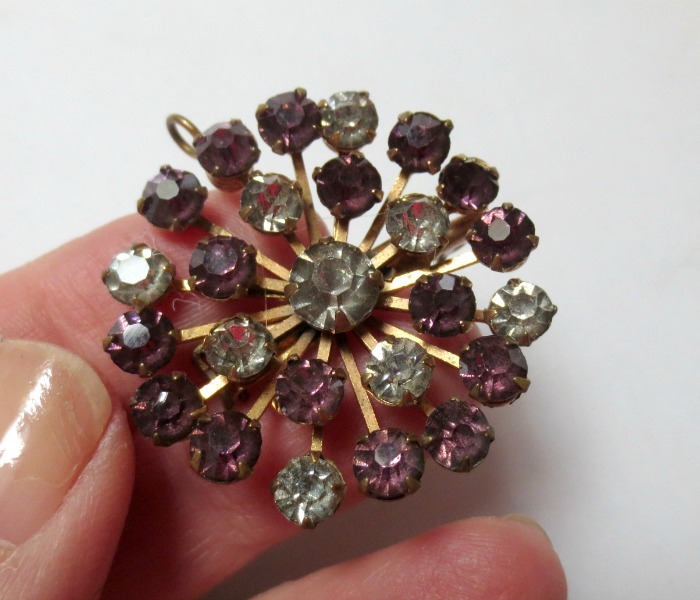 And this little rhinestone pin/pendant was quite sweet. Not worth much but I’ll sell it together with a few other pins. 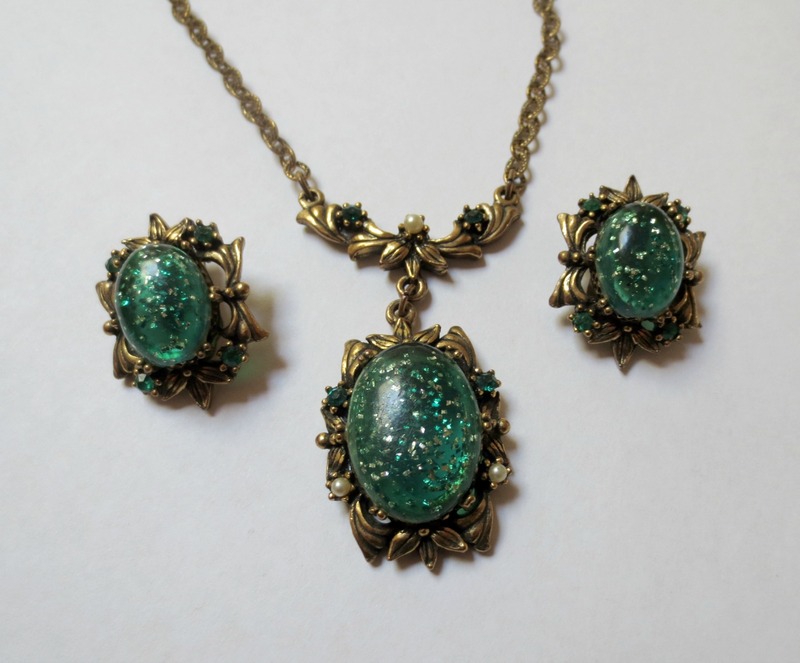 One of my best finds was this 1940s confetti lucite necklace and matching earrings set. It is unique and in fabulous condition. I also decided to take a chance on some playing cards, which sometimes are quite collectible. (Well, they were only 50 cents, so not a big risk!) These are from N.V. Stoomvaart Maatschappli or the Netherlands Steamship Company. Haven’t been able to find out much about them yet, though another seller dates these to the 1930s and is pricing them at $35. So these could work out well! 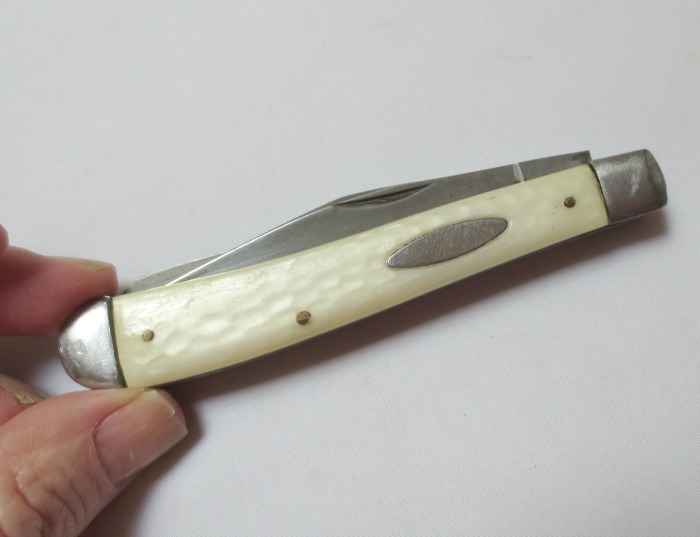 One was this little Sabre, made in Japan, #617 pocket knife for $6. Because they had it originally priced at $12, I thought they knew it was a really collectible knife. Well, as far as I can tell, not so much. Drat! 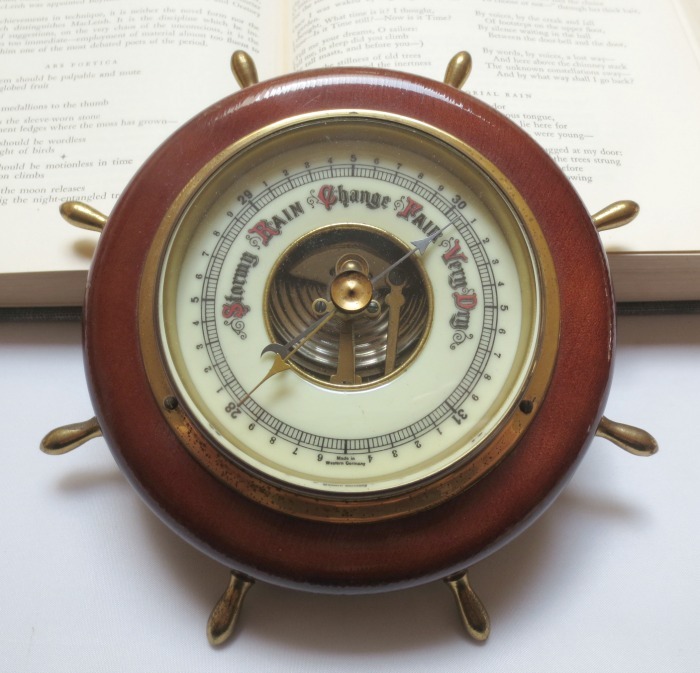 And I bought this little vintage German ship wheel barometer for $10. (I know, I know…what was I thinking?!) And on top of that, I don’t think it’s working! It does have a really great face and a cool view to the mechanism, so I could still sell it for steampunk supplies. So mostly a good second-day haul! Afterwards I picked up a delish Turkish coffee at Philz (made by my daughter!) and headed to church. All in all a fabulous morning. How about you…any good finds lately?